When Millard Fuller Legacy Build volunteers wrap up each day of working alongside Taneka Miles in building a new home for her and her seven daughters the week of April 15-20 in Americus, Georgia, most will head back to their hotel rooms or volunteer lodging to wind down and relax in order to be ready to start working again the next morning. Miles, however, will not be getting much down time during the week. When her day ends on the job site, it will be time for her to report to her night job at PharmaCentra. It will be a long week but well worth it for the 33-year-old mother of seven daughters who became homeless when she and her husband separated in March of last year. When she recalls the pain of her family falling apart and losing their rented home, the tears flow. When she thinks of how her daughters will soon have a decent home thanks to the Millard Fuller Legacy Build and Fuller Center for Housing volunteers and supporters, the tears flow again. She may be humble and grateful now, but she spent most of the past year terrified. After the separation, they stayed briefly with a friend. But adding eight people to a home environment is tenuous at best. When bed bugs became a problem in that home, Miles slept in the car with one of her daughters who suffers from asthma. After that, she stayed briefly with a cousin, then in a dilapidated trailer just outside of Americus. The landlord refused to make repairs without going up on rent Miles already could not afford. Soon, she was on the streets again. Finally, her bishop and a deacon’s wife at Friendship Missionary Baptist Church got her in touch with Evangelist Snipes of the Sumter Area Ministerial Association. SAMA had been helping the area’s homeless find temporary places to stay for years, but Snipes felt more needed to be done. She and Kirk Lyman-Barner of the Americus-Sumter Fuller Center for Housing (this year’s Legacy Build hosts) created a new nonprofit — Americus-Sumter Transitional Housing Ministries — through which the homeless are able to apply for lodging and are then given a mentor. The mentor helps them as they work to get a job, manage an income and handle any personal problems they may be battling. 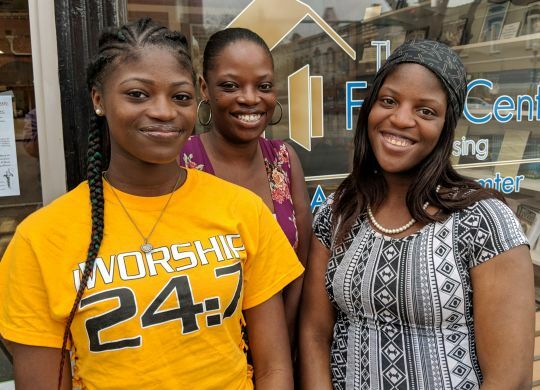 Going to Transitional Housing Ministries would wind up being a blessing that helped her get back on her feet, find temporary housing and will soon see her as its first major success story — a story that comes to a crescendo on April 20 when their new Fuller Center house is dedicated. However, Miles remembers going to the organization for help as her lowest point. Fortunately, this new home will not be a handout. All new Fuller Center for Housing homes are built in partnership with families. The families repay the costs of the home build, on terms they can afford to pay, with no interest charged and no profit made. Those repayments go into a Fund for Humanity to help others in the local community get the same hand-up. Therefore, not only will the Miles family own their home with payments far less than they would pay for a substandard rental unit, but their repayments make them givers themselves. This is enlightened charity, not a handout. It is a true partnership. Local volunteers, supporters and donors are still needed for the 2018 Millard Fuller Legacy Build. To learn more, please click here. Many thanks Chris. Good to read these heart – warming stories We in Africa continue to receive the inspiration to continue doing what we are doing. within the Fuller. It is a blessing to have the opportunity to work with someone who are working ,”with you” on their behalf, and are not trying to, “Get over” on your kindness. Temeka has been a model mentee and has done and followed every thing that we have told her to do as we seek to help her in their endeavors. Thanks to all of the wonderful people that have joined in our efforts to make a difference in the lives of those we serve, one family at a time. Thanks to the “Fuller Center” and all of the volunteers that care enough to give their best by volunteering their time, finance, prayer,and labor making it happen.